Pakistan is God gifted country, blessed with numerous tourist attractions and sites that have been a source of intense and immense tourist activity for years. One of these tourist attractions was the Khyber Steam Safari - a travel into a two bogies train, hauled by two vintage 1920 steam engines ( HGS 2-8-OS ), built by the Valcon Foundry Kingston and Company, the United Kingdom, from Peeshawar Railway Station to Landi Kotal near the Pakistan - Afghanistan border, through the famous Khyber Pass. 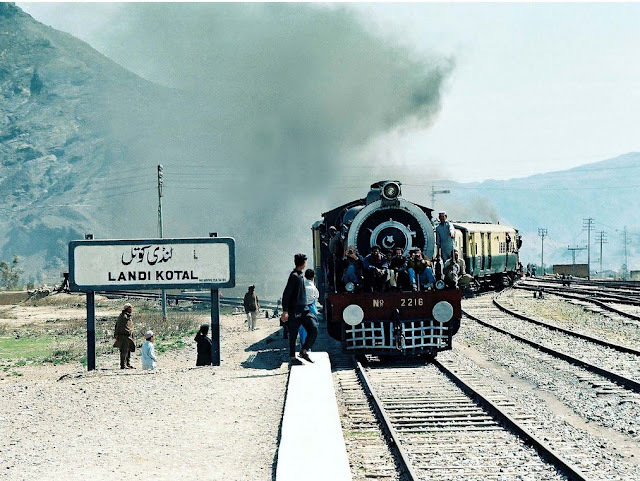 The railway line from Peshawar to Landi Kotal was laid in the 1920s by the British in order to build up their forces along the Afghanistan to thwart any possible Russian aggression. The railway line passed through one of the most difficult mountainous areas of the world, for which the British constructed 34 tunnels and 92 bridges and culverts. 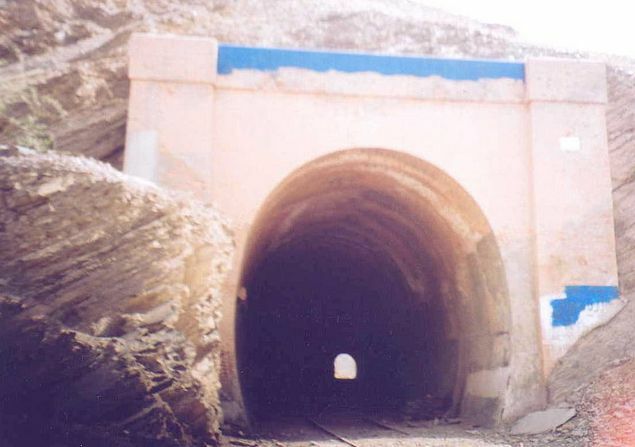 The gradient of the railway line was continously increasing and at one point, At one point the track climbs to 130 meters within a distance of 1.4 kilometers, and the train had to be hauled by means of the famous Shagai Spur, a section of the track shaped like a 'W' with two reversing stations. Like the famous Zulu Turn that the aircraft landing at Skardu airport had to negotiate, there is a Whisky Turn or a 'W' shaped turn that the train from Peshawar to Landi Kotal had to negotiate. The turnings were so difficult and straining, that the two engines, one from the front and the other from the rear had to pull and push the train labouring with all their power, lest the train started to 'stall' and roll backwards. As can be seen from the sketch above, the railway track twists over the Kyber Pass with gradients as steep as 1 in 33 near the summit at Landi Kotal. And the steam engine really has to pull hard to take the coaches atop the summit. When the train was commissoned, the local tribal people were allowed travel free as part of the contract agreed upon when they allowed the British to build the railway through their territory and this rule continued tyo be honoured while the steam engines emitted black smoke on the Peshawar-landi Kotal route. 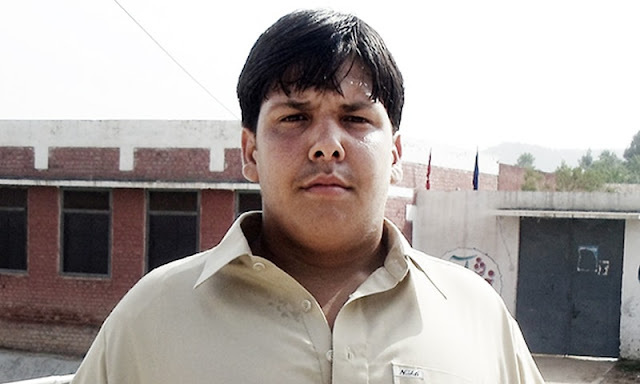 The train left Peshawar at 07:00 early morning and reached Landi Kotal around 11:30. From here the tourists were taken by road to the Michni Frontier Constabulary Post at the Torkham Border from where they were shown the Torkham border between Pakistan and Afghanistan. Upon return journey, they were to have lunch at the famous Khyber Rifles' Mess. Many old British Army Officers found it amusing to see the old photographs hung on walls in the corridors of the mess and reminisced memories of the days when they served here. 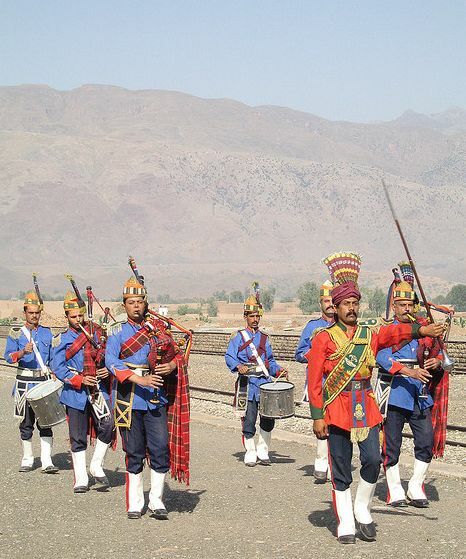 Not only that, on many stations, the bands played for the tourists and Khyber Rifles' men amused the tourists with famous Khatak Dance. The train service that commenced in 1925 continued unhindered til 1982 as Khyber Train Safari, when it was stopped due to financial constraints of Pakistan Railways. 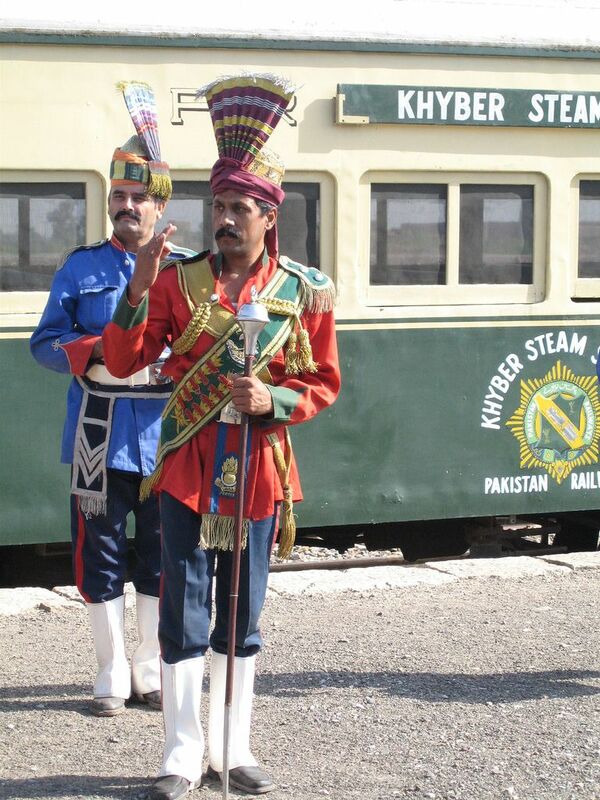 However, in 190s, the Pakistan Railways, in collaboration with a local tour operator, commenced the service as Khyber Steam Safari. With the efforts of the tour operator, the additional add-ons like the band and dance displays and luncheon at Khyber Rigfles' Mess were added. Steam and Safaris Ltd North-West Frontier Explorer Tour Group is one such group of enthusiasts that travel around the world and find pleasure in riding trains pulled by the steam locomotives such as HGS 2-8-0s, CWD, SPS 4-4-0s, and Metre-gauge MS, YD & YE classes. 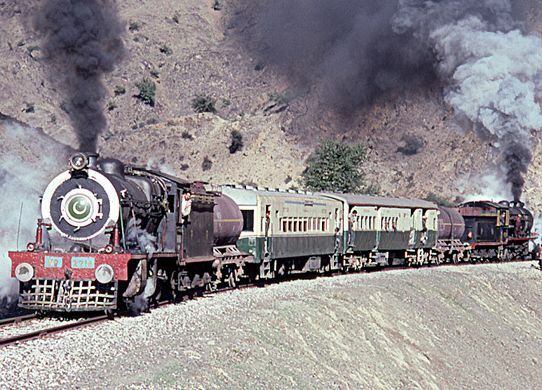 In 1997-98, the Steam & Safaris Ltd North-West Frontier Explorer Tour Group toured Pakistan and had a rollicking time travelling in steam engine pulled trains. 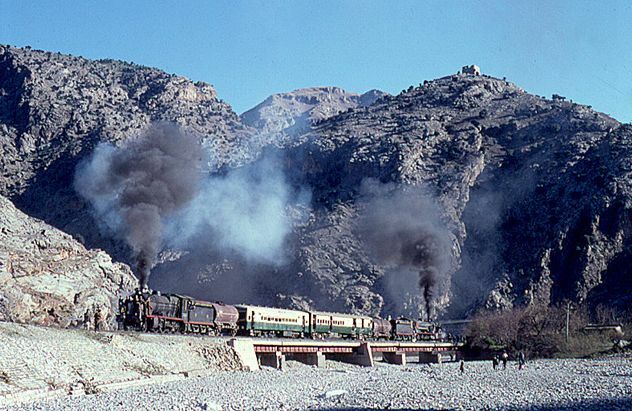 The S&S group's main attraction had been their journey from Rawalpindi to Landi Kotal, just short of the Khyber Pass, through Peshawar and Jamrud as part of the famous Khyber Steam Safari. I have myself traveled on this Safari many years ago from Peshawar to Landi Kotal and can still feel the adventurous journey. 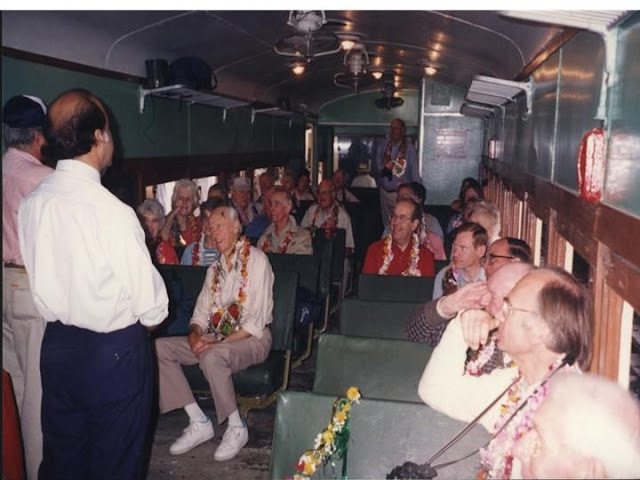 The Khyber Steam Safari or the KSS ran another two decades till its the last of KSS left Peshawar May 14, 2007, with some 15 ambassadors and high commissioners of European Union countries on board. Since then, due to militancy in the area and the floods that ravaged Pakistan in 2010 and uprooted the railway track from many a places, the KSS remains suspended , indefinitely for the time being. 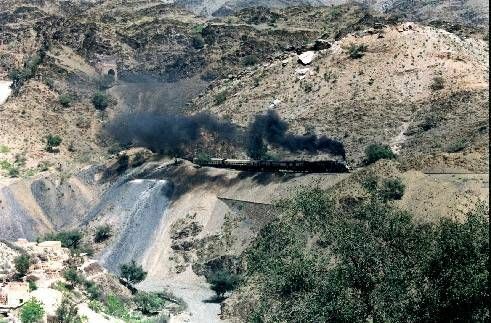 May be some day, when militancy is finally defeated and life return to normal, the KSS steam engines's whistles and billowing black and white smoke are again heard and seen on the Peshawar-Landi Kotal Section, bringing back tourism to this remote, treacherous, yet exotically beautiful area. I agree. It is very fun to be a Tourist in your own hometown. Even though you have lived there for a lot of years, you will still discover amazing things every now and then. You have a pretty cute outfit there! I like the helpful info you provide iin your articles.